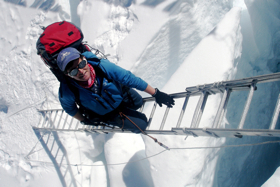 ← Everest 3.0: Hello from your Everest Curriculum Team! 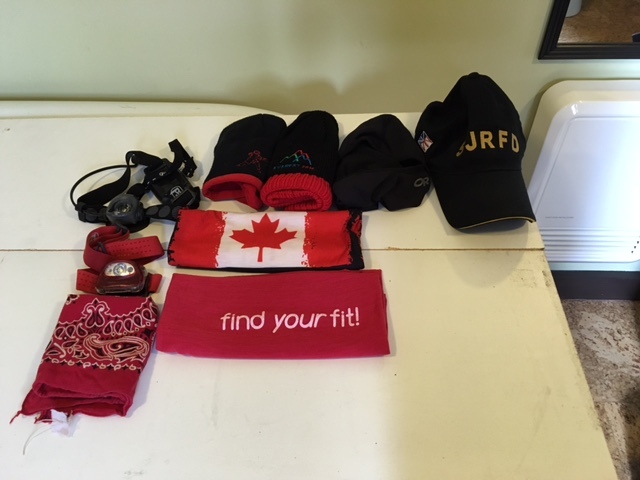 Here’s what I packed for my head…two warm hats, a balaclava, sun hat, two buffs and two headlamps (important items get redundancy. 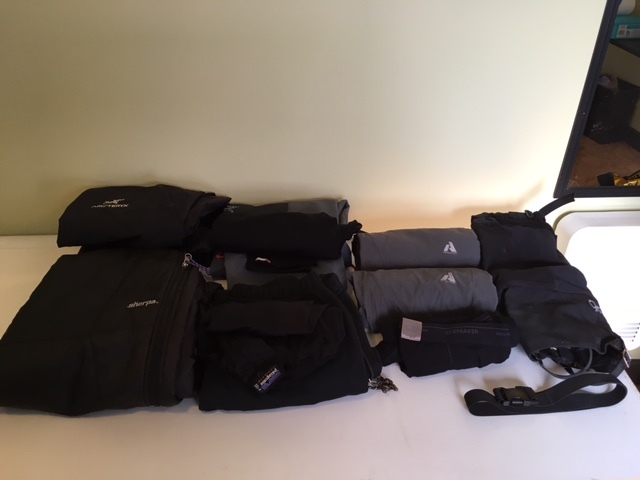 Here’s what I packed for my shoulders…and upper body. 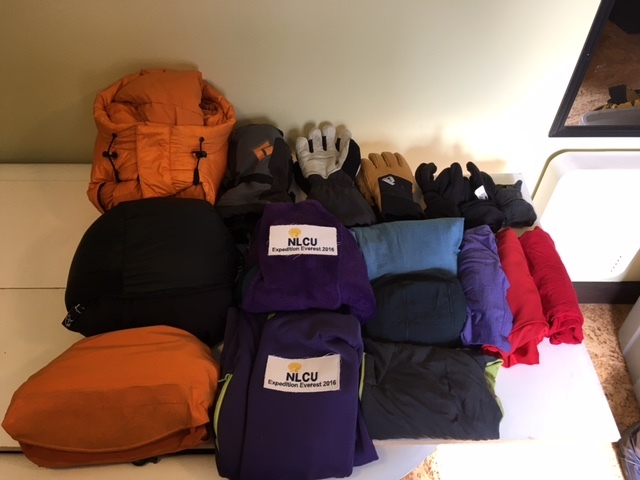 Down parks, puffy jacket, Gore-tex shell, two fleeces, three merino wool hippies, three merino wool t-shirts, summit mitts, guide gloves x2, two pairs working gloves and one pair of electronic friendly liner gloves. 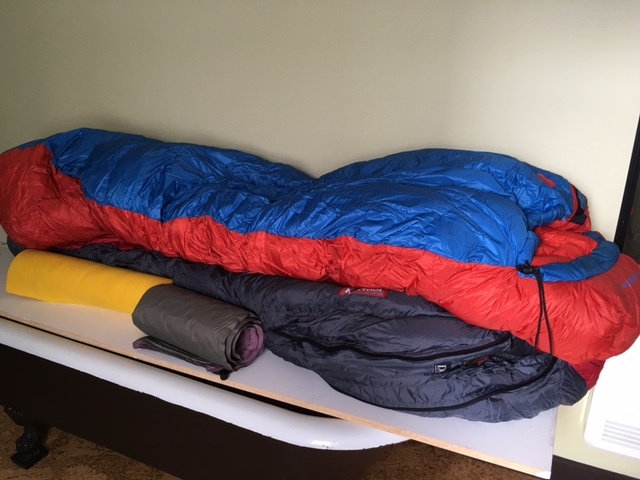 Here’s what’s going to cover my knees: Puffy pants, Gore-tex shell pants, guide pants (with and without side zips), three pairs base layer long johns (with and without zippers), trekking pants, belt, and gaiters. 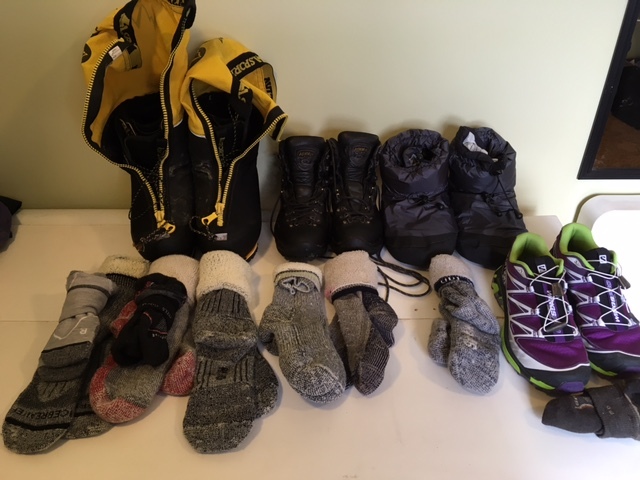 Here’s what going to cover my toes: Summit boots, trekking boots, down booties, camp shoes, three pairs of climbing socks with liners, three pairs of trekking socks, and one pair of socks for my camp shoes. All of the above (and much more) are now stuffed, packed, and zipped into two big duffels and I’m ready to enter the airplane bardo later tonight. I’ll arrive in Kathmandu Tuesday morning KTM time, Monday evening YYT time. 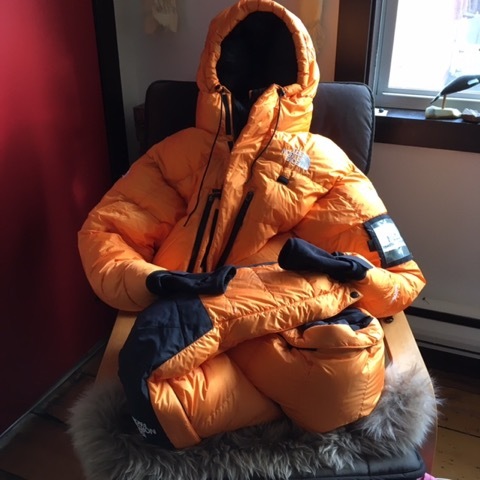 Thanks for all the wonderful send-off messages…I feel well loved, feted, and appreciated as I head off to this big challenge called Everest 3.0. Catch you from Kathmandu! This entry was posted in Everest 3.0 and tagged 2016, climb, clothing, Everest 3.0. school curriculum, Nepal, Seven Summits. Bookmark the permalink. Priority #1 is return flight, Happy Climbing! Good luck all the way to the top!